This looks like it might have been taken at the Saddle and Cycle Club, with the Edgewater Beach Hotel in the background. Seller's caption: 1923 Stutz Motor Co. Car in 1961. 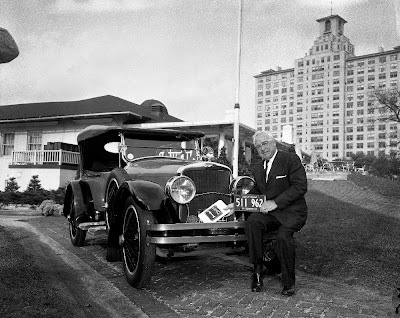 Charles Carpenter puts a 1923 auto tag on his 1923 Stutz Automobile. Harry C. Stutz (1876 in Ohio - 1930) was a United States automobile entrepreneur, engineer, and innovator in the automobile industry. Stutz grew up caring for and repairing agricultural machinery on the family farm. Automobiles and engines fascinated him. Stutz built his first car in 1897, and then a second auto using a gasoline engine of his own design and manufacture. In 1905, he designed a car for the American Motor Car Company. He soon left the new company and founded an enterprise that he later renamed it Stutz Motor Company. He was also instrumental in creating the Stutz Fire Engine Company, as well as the H.C.S. Motor Car Company in 1919. In 1929 he formed the Stutz-Bellanca Airplane Company. Manufacturer: 1920 - 1925 The H.C.S. Motor Car Co. - Indianapolis, Indiana.